UW researchers have developed a multifunctional nanoparticle that eliminates the background noise, enabling a more precise form of medical imaging - essentially erasing the haystack, so the needle shines through. A successful demonstration with photoacoustic imaging was reported today (July 27) in the journal Nature Communications. Nanoparticles are promising contrast agents for ultrasensitive medical imaging. But in all techniques that do not use radioactive tracers, the surrounding tissues tend to overwhelm weak signals, preventing researchers from detecting just one or a few cells. "Although the tissues are not nearly as effective at generating a signal as the contrast agent, the quantity of the tissue is much greater than the quantity of the contrast agent and so the background signal is very high," said lead author Xiaohu Gao, a UW assistant professor of bioengineering. The newly presented nanoparticle solves this problem by for the first time combining two properties to create an image that is different from what any existing technique could have produced. The new particle combines magnetic properties and photoacoustic imaging to erase the background noise. 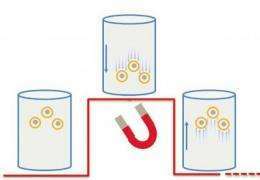 Researchers used a pulsing magnetic field to shake the nanoparticles by their magnetic cores. Then they took a photoacoustic image and used image processing techniques to remove everything except the vibrating pixels. Gao compares the new technique to "Tourist Remover" photo editing software that allows a photographer to delete other people by combining several photos of the same scene and keeping only the parts of the image that aren't moving. "We are using a very similar strategy," Gao said. "Instead of keeping the stationary parts, we only keep the moving part. "We use an external magnetic field to shake the particles," he explained. "Then there's only one type of particle that will shake at the frequency of our magnetic field, which is our own particle." Experiments with synthetic tissue showed the technique can almost completely suppress a strong background signal. Future work will try to duplicate the results in lab animals, Gao said. 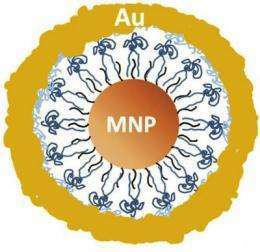 The 30-nanometer particle consists of an iron-oxide magnetic core with a thin gold shell that surrounds but does not touch the center. The gold shell is used to absorb infrared light, and could also be used for optical imaging, delivering heat therapy, or attaching a biomolecule that would grab on to specific cells. Earlier work by Gao's group combined functions in a single nanoparticle, something that is difficult because of the small size. 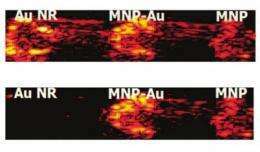 "In nanoparticles, one plus one is often less than two," Gao said. "Our previous work showed that one plus one can be equal to two. This paper shows that one plus one is, finally, greater than two." The first biological imaging, in the 1950s, was used to identify anatomy inside the body, detecting tumors or fetuses. The second generation has been used to monitor function - fMRI, or functional magnetic resonance imaging, for example, detects oxygen use in the brain to produce a picture of brain activity. The next generation of imaging will be molecular imaging, said co-author Matthew O'Donnell, a UW professor of bioengineering and engineering dean. This will mean that medical assays and cell counts can be done inside the body. In other words, instead of taking a biopsy and inspecting tissue under a microscope, imaging could detect specific proteins or abnormal activity at the source. But making this happen means improving the confidence limits of the imaging. "Today, we can use biomarkers to see where there's a large collection of diseased cells," O'Donnell said. "This new technique could get you down to a very precise level, potentially of a single cell." Researchers tested the method for photoacoustic imaging, a low-cost method now being developed that is sensitive to slight variations in tissues' properties and can penetrate several centimeters in soft tissue. It works by using a pulse of laser light to heat a cell very slightly. This heat causes the cell to vibrate and produce ultrasound waves that travel through the tissue to the body's surface. The new technique should also apply to other types of imaging, the authors said.